Home » Reviews & Testimonials & Case Studies » Job Shop Scheduling Success Story: Big Company, Big Improvement and Big Employee Involvement! Job shop scheduling story PDF here. 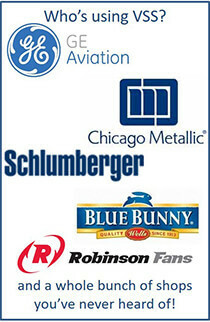 Even the largest and most successful corporations want to improve delivery performance, which is what motivated Chicago Metallic Corporation (CMC), a world leader in custom architectural building products, to get on board with the Velocity Scheduling System (VSS), a system for custom job shop scheduling which brings all production people together on a daily basis to meet those challenges as a team. Old school thinking often keeps workers on the floor out of the loop, and the byproduct can be boredom, which leads to apathy, which leads to slow or no improvement in performance. Workers are very accustomed to and probably too comfortable with taking four or five assignments to the floor for their shift, says CMC production manager Bob Tunney, so they don’t like being pulled off one of those jobs once they started it. But that’s exactly what’s often necessary with VSS, since now everybody can readily see which jobs need to be attended to and which can be set aside for later. Busy = Chaos and Stress. “Even on our worst days, our delivery was 88 percent (which is VERY good for a highly custom job shop),” Tunney said, but when they got busy it was chaotic and stressful for everybody. They knew they could increase that number, so their senior people searched for a better way to schedule. They signed up to learn the Velocity Scheduling System process after their purchasing manager saw the opportunity online.